Brittany, France, ca. 1440-1450 ; Paris, France, ca. 1500-1510. Purchased by J. Pierpont Morgan (1837-1913) from Pearson in 1906; J.P. Morgan (1867-1943). Ms. book of hours for Sarum use (Hours of the Virgin, Office of the Dead); written and partially illuminated in Brittany, France, ca. 1440-1450, and illuminated in Paris, France, ca. 1500-1510. This manuscript was illuminated in two campaigns: in Brittany, ca. 1440-1450, and in Paris, ca. 1500-1510. 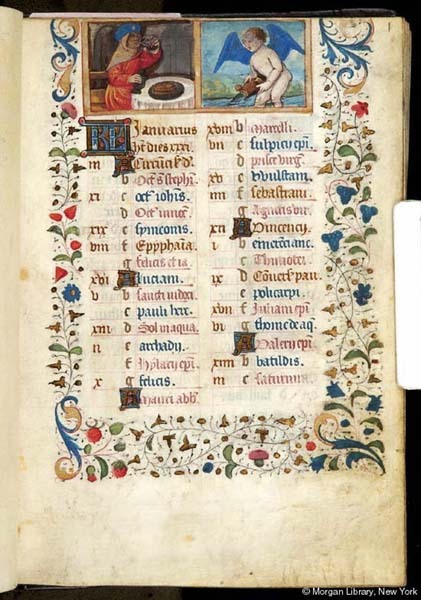 Note that "from the original campaign of illumination only one much repainted miniature, the Virgo lactans [fol. 19v] and many decorated borders remain. These, like the litany, suggest that the manuscript was begun in Brittany about 1440, presumably for an English patron. Perhaps because of the withdrawal of the English occupying forces, the illumination was left unfinished for over fifty years and was only taken up again around 1500 or shortly after."--Cf. Last flowering, p. 71. Decoration: 29 large miniatures, 17 small miniatures, 24 calendar illustrations. Artist: Master of Philippe of Guelders and a collaborator.